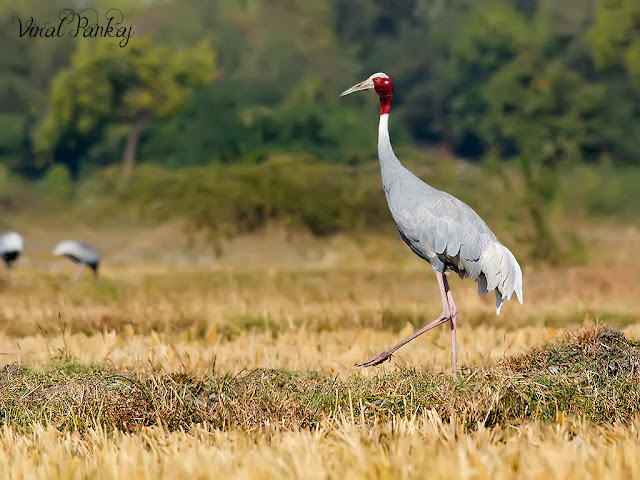 Sarus Crane is tallest flying bird of World. It is non-migrating and also the only resident breeding crane of India. We are always fascinated about the Sarus. We often saw these birds in Thol Lake during our college days. But after started bird photography we first saw Sarus Crane near Devisar Lake, Bhuj. Even after trying many times we did not get success to click some good shots. 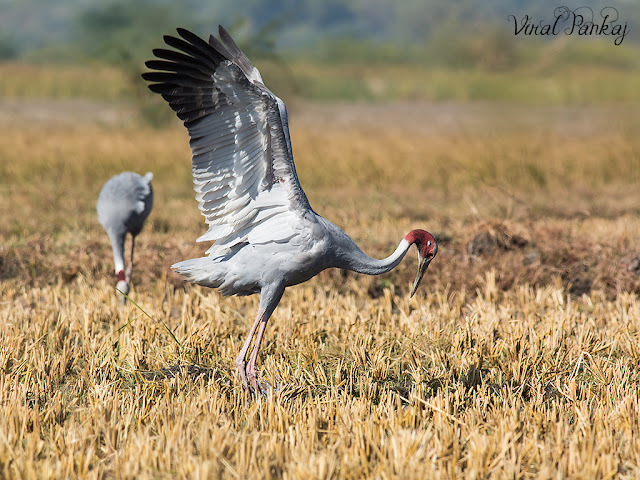 On one afternoon at Thol Lake we were lucky enough to observe landing of almost 48 Sarus Crane in group of 2-4. Still we did not get good shots because they were landing far in the lake. While searching for White Stork at Pariyej finally we got jackpot….! 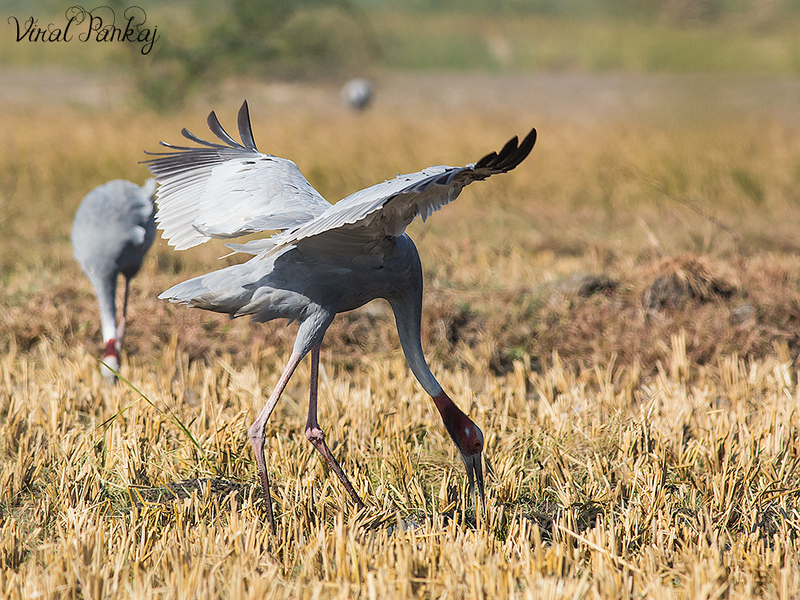 There were so many Sarus Cranes in cut-down and water-filled paddy field. First word come out of our mouth is just big wowwwwwwwwwwwwwwww….! We are in land of Sarus Cranes. We were even more delighted when our Sarus Crane count crosses the figure of 100. 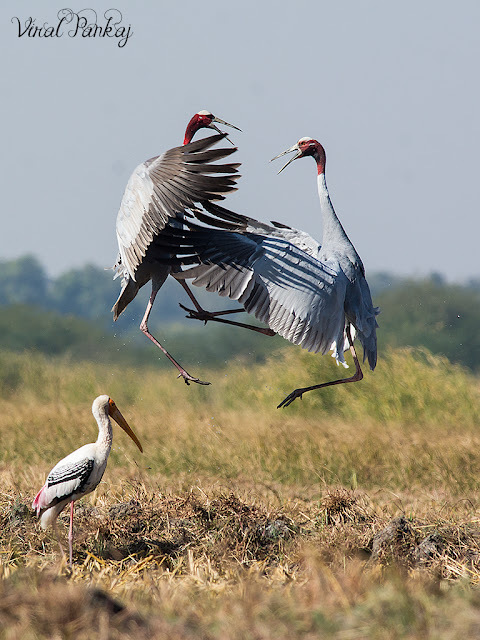 We know that large number of Sarus Cranes seen in Kheda district particular in Matar (મ।તર). But this is just highest count for us. There were also few Painted Storks and Common Cranes around this group. Once they replied to the call of flying Common Crane group from sky. They were busy in calling, foraging, playing and practicing display for next season. We spend almost 3 hours with them in harsh sunlight-there was lots of actions and so much to observe. They allow us to take as many as photographs we want to take. Most interesting thing was spectacular display performed by few pairs of Sarus Crane. Their dancing displays involves various behaviours such as jumping, bowing, running in short circles around the other, tossing some weed and wing-flapping. Displays show the birds in standing posture, with head thrown back and bill upwards, raises the wings over its back during the unison call, while positioned close to each-other. In any move they looked so elegant. There are no more words to express the amazing feeling we have. Wow, that was so cool. Thank you for sharing!